While the city is heralding the $22.5 million redesign of the Fullerton/Damen/Elston intersection as a win for making urban travel more safe and efficient, it’s really more of a tie. Yesterday Mayor Rahm Emanuel officially opened the new, curving section of Elston, which bypasses the intersection of Fullerton and Damen, where the three streets formerly met in a six-way junction. The intersection was known for traffic jams and fender benders. Final work on the project will continue through this spring. It’s true that we may see fewer minor crashes, such as rear-end collisions, now that the six-way has been eliminated. However, it remains to be seen how safe the new curving bypass (which I’ve nicknamed “The Hotdog” in honor of the adjacent Vienna Beef factory) will be. Most stretches of Elston in the city have one travel lane in each direction, a turn lane, and buffered bike lanes. Even the notoriously suburban-style stretch northwest of Fullerton/Damen, lined with big-box stores and driveways, which makes it unpleasant to bike or walk on, still has this relatively compact layout. 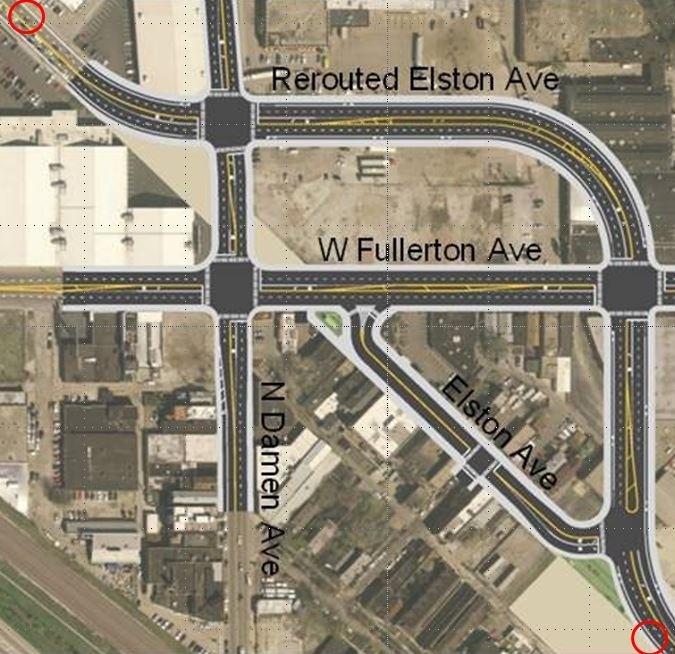 But the Elston bypass has four travel lanes, with turn lanes at its Damen and Fullerton intersections that balloon it into a five-lane roadway at these locations. This layout encourages speeding, which could lead to an uptick in more serious crashes. The notoriously car-centric Illinois Department of Transportation collaborated with the more progressive Chicago Department of Transportation on this project. Presumably the state insisted on widening this segment of Elston, based on the false notion that creating more capacity for cars relieves congestion, when it actually just tends to encourage more driving. On the plus side, the bypass has curb-protected bike lanes, which were nicely plowed and salted this afternoon, save for the slush-filled driveway of the new Mellos candy and nut store, located just east of the wiener factory. But the curb-protected bike lanes are absolutely necessary on this stretch of Elston, because bicyclists shouldn’t be expected to share the road with speeding cars. Another benefit of the project is that some sidewalks have been widened. We applaud the city’s redesign because it will make the intersection safer for everyone while protecting the most vulnerable road users on foot and bike. The rerouting will reduce confusion and dangerous traffic patterns, while the new protected bike lanes, wider sidewalks and safer crossings will add a crucial layer of protection. Chicago’s six-way intersections are notorious hot spots for traffic crashes and especially tricky for people biking and walking, and Damen/Elston/Fullerton was even worse because Elston was offset from the Damen and Fullerton intersection. We encourage city leaders to make similar improvements at other six-way intersections. What’s your opinion of the street remix – do you feel the new Fullerton/Damen/Elston set-up is better than before, worse, or neither here nor there? I really can’t wrap my head around why they would add 2 extra travel lanes to that one small portion of Elston. It’s a brand new roadway that already needs a road diet! If I remember correctly the new retail area planned here is going to have a preposterous amount of parking spaces with two tiny little buildings on it, rather than something walkable with a small amount of parking. More suburban style development here, and people wonder why traffic is bad. I think my answer about good/bad/indifferent is that it’s a drop in the bucket: Elston Ave has become more and more retail focused, and the resulting traffic makes it not worth the effort for me. I stopped biking on Elston as it has shifted from industrial to retail over the past 15 years. It is technically the fastest route for me to get from home to the Loop, but I’ve been seriously irritated by the increasing amount of curb cuts and traffic (as an alternative to the Kennedy), so I skip it. Seeing that the Mid-Town Tennis club was effectively being replaced with a massive car dealership was the final dealbreaker for me. Crossing Fullerton and Damen was never an issue on a bicycle; I think it was frustrating for cars. The change isn’t something I much care about; crossing Ashland at Elston (esp. NB) was always much much scarier, esp. as you have to navigate with all the cars trying to head N onto Ashland. I fully support calling it the Hot Dog though! I think the question is: what is a human/ped friendly design for these large 6 way crossings? Does one exist? I thought the old Elston/Fullerton/Damen was actually OK because it was broken up into two pieces. One could usually cover the distance without working that the signal would change before you’d fully crossed on a bike. Unlike Ashland/Lincoln/Belmont, which takes an eternity to cross. I used to travel eastbound on Fullerton everyday and never had any problems. Now with an extra light that I’m sure isn’t in sync with the others, I don’t see this as much of an improvement. I walk through this intersection every day from California & Fullerton to Ashland & Fullerton and occasionally bus when the weather is bad enough. Not having to crawl along the bent metal bumpers on the old triangle is a godsend and buses are moving through super fast now. I’m a little worried currently about how wide Damen is now, especially since the temporary stoplights don’t have a walk signal and the temporary(?) crosswalks are a joke (the crosswalk has a bend in it now going north/south on the west side of Damen which I sincerely hope isn’t the final design). I don’t think I’ll switch to biking since Fullerton west of Damen is still a mess, but I do think the smoother traffic flow is making being a pedestrian much safer. There are less cars turning at Damen & Fullerton and the the new Fullerton & Elston Court intersection has felt safe crossing with the walk signals since it opened. I noticed they didn’t plow the new bike lanes last week and a car was parked there until the morning of the mayor’s announcement. Hopefully the plowing issue was only because they weren’t “officially” opened. We’ll see! Lol good one “new roadway already needing a diet”. We see similar shaping up for the North LSD rebuild. “You want a dedicated bus lane. It’s got to be wider.” ILDOT has to make every road feel suburban. The idea that there is such a thing as streets with an urban feel is incomprehensible to them. South LSD is a good example of a suburban feel. You even lose the sense you are in a park on South LSD. The land on either side is just an extended shoulder. And this bodes bad for the rebuild of North. Judging by the early plans there are to put in the now vacated land around that area, get ready for a lot more big box and curb cuts. Car dealerships are weird businesses. They want to be easy to drive to (duh), but the way they ignore transit means that if you have to drop off your car for service and come back later, you’re basically stuck. They can’t afford too high of a property cost, because they take a LOT of footprint; lots of used car lots are a sign of extremely cheap land. But high-end or luxury dealerships can afford moderately-expensive land, but not the very top. It’s a sign of where the dealership thinks this corner is going, because if it really does take off and become a vibrant area (not likely, but go with me), they won’t be able to afford the property tax anymore. Are they still protected by a lot of regulations? I can’t imagine they’d be that common if they weren’t. I can imagine there would be the opportunity to order test drives and car deliveries online if they weren’t protected in this way. They also wouldn’t take up spaces in cities – cars would be delivered from warehouses placed in areas with cheaper real estate. I was pretty sad when I read that the closed dealership at Ashland and Division was being replaced by another – it’s been an eyesore, an obstacle to pedestrian friendly development, and a source of a lot of complaints with them blocking the sidewalk much of the time. Car companies divvy up territories for their dealers for cartel-like reasons: to preserve the ability for a given number of dealers per manufacturer to survive and profit. There are some state and local laws as well, which came up recently when Tesla Motors wanted to sell their cars primarily online or in specific Tesla-only stores (like the Apple store). This also protects the business model of dealerships, because — let’s face it, if you knew exactly what you wanted, didn’t feel like getting a hard sell, and trusted the ecommerce infrastructure, who WOULDN’T go straight to Toyota’s website to buy a Prius and order it delivered to a local meeting point? That cuts out dealers entirely and is currently forbidden. Even if Tesla didn’t want to have dealers at all, so there are no franchisees to protect. I ride through the hot dog everyday (what?). 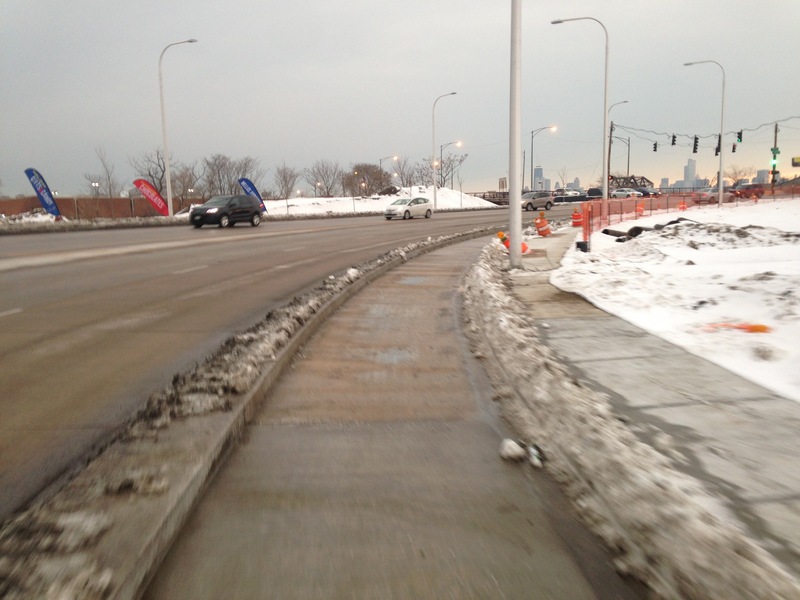 From my perspective, there were no major gains for #bikechi. The concrete PBLs are great but in both directions there is a bottleneck (red circles in image) that create a dangerous situation for bicyclists and motorists. The PBL creates a sense of safety and separation that immediately disappears as two traffic lanes merge into one next to the painted bike lane, completely negates the positive gains. Hopefully the concrete buffer is extended past the bottlenecks next year. As I biked Elston to downtown this morning, I noticed how many more drivers were speeding between Damen and Webster than did in the previous configuration. It’s especially nerve-wracking as the southbound bike lane loses the curb protection right at the bend, where drivers are really speeding up in anticipation of the lanes reducing to two. I don’t understand IDOT’s? CDOT’s? love of expanding the number of lanes at intersections then narrowing again, as done here and being done at Western and Belmont. It seems contrary to every principal they are allegedly embracing in road design. I’m also not crazy about the bike lane configuration at the intersections, as the visibility to drivers turning right seems reduced. I’ve noticed many other cyclists pulling way up in to the crosswalks, as I do, seemingly to be more visible to drivers. And one note on the plowing of the lanes – the southbound lane has a huge ridge of snow perpendicular to the lane as the curb disappears approaching Fullerton. Kind of a bummer. I wonder if American cities will ever be able to compete globally in terms of design as long as we’re held hostage by conservative rural capitals with strong ties to the auto industry. So frustrating. I ride this route everyday to and from work in the Loop. The new section of Elston seems grossly overbuilt and it is somewhat of a waste land. The protected bike lanes are nice but have been cluttered with debris and construction detritus while the project is being completed. It looks like the PBLs have been cleared of snow save for a ridge of snow at the end of the lane at Fullerton (SB) and a slushy mess at the Melos Candy and Nut store. I share Eric’s concern about the bottlenecks where the PBL ends and the bike lane is a painted bike lane on the south and going around the bend near the Ford dealer on the north. While I agree that it is not an optimal solution because it will induce speed, I think it is a net positive compared to what was there before. However, the project is not complete yet and it could get better or worse depending on work to be finished. I would add the word suburban along with rural. Indeed there are many urban neighborhoods whose residents are still enthralled with their cars. It is a hard paradigm to shake. But yes that is the issue. The theory at Western/Belmont is that because Belmont will have a shorter portion a signal phase now that Western goes through instead of over the intersection, they add a lane each direction so that the intersection will still have similar throughput. ie, in theory, halve the signal phase time, double the lanes = same number of cars get through. Yup, Elston is well on it’s way to becoming “Little Schaumburg”. My absolute least favorite spot is btwn Diversey and Logan Blvd. No one can see when exiting the David’s Bridal (NB) and there is permanently someone illegally parked in front of the Panera (SB), so it’s just dangerous. That barren stretch south of Logan isn’t much better. So many damn lots. All this non permeable pavement right next to a river too. Makes me want to cry. True, when it comes to streets and transportation the Chicago burbs and downstate have more in common than not. Amen regarding the horror show that is NB Elston at Ashland. I have had more near-misses there than the rest of Elston and Milwaukee combined. I saw this in action a few days ago. Stopped at the red light NB on Elston at Damen, I was in the left lane, another car in the right lane. Green light, we head NW toward your noted bottleneck. The car next to me stayed next to me, driving in the bike lane. I suspect the person was glued to their phone, but they had fallen about 1/2 car length back, so I couldn’t really see. Luckily it was a frigid night and there were no cyclists in the lane for that moron to mow down. End result, I completely agree, they should extend the curbs through the bottlenecks so that cars are forced to merge and don’t just keep going in the bike lane. The car dealership did *not* replace Mid-Town. It’s on a completely separate parcel. Mid-Town lost part of its building on the north/east side of Elston to the construction, but that’s it. Mid-Town expanded (including an new enormous parking garage sadly) on the south/west side of Elston. Home Depot’s lot got smaller with the new outbuilding. Half is a Mattress Firm that’s already open, other half is a restaurant with a drive-thru, but I’m not sure what it is. It doesn’t look like the previously proposed Chick-Fil-A. It’s hard to put anything walkable in that spot as there just aren’t that many nearby residents who could walk to it. on it’s way? hasn’t it already been one for quite some time? I’ve avoided going to any stores on that stretch on weekends for years, but at least some of that had to do with the F/D/E intersection backing traffic up. Yah, I’m not sure. I didn’t count the Value City Furniture lot, so it’s probably a wash. And another Mattress Store, just what the City has been dying to have! So I get that in some places there are a bunch of Mattress Firm locations near each other because they bought up a few other chains (Sleepy’s, Back to Bed and Bedding Experts) and mattress stores are franchises, so it makes sense that maybe one was a Sleepy’s and one was a Bedding Experts who were neighbors. Now they’re both Mattress Firm, but they both have contracts, so too bad, there’s now multiple stores close by. But this one on Elston? There is already one at Elston/Logan in the building with Panera and xSport and there’s already one in the strip mall across the street from the new one (back in the corner by Dollar Tree between Strack and roomplace). It doesn’t appear either of those have closed/moved to the new location (all 3 are on Mattress Firm’s website). If I owned either of those two locations, I’d be pretty unhappy that another one opened up that close. Especially the one buried back in the strip mall where there’s now one across the street in a much more prominent location. As to the drive-thru, google found me a city PD doc. It’s a Starbucks. That was actually my initial thought, the awnings are black, etc, but I ruled it out because there is already a Starbucks across the street (also back in the corner by Dollar Tree). As opposed to Mattress Firm, I presume this is a move from a location that isn’t as visible to a more prominent one and also adding a drive-thru to add to the “Little Schaumburg” vibe. What that theory fails to take in to account, though, is where the volume of vehicles will go when one lane disappears…. I went through it last night and it just doesn’t look to me like they’re coming back to do anything like that. They didn’t leave any space for it. I walk and bike around there quite a bit because, although I live West of California, it’s the closest grocery store. A friend and I were just commenting on how unfriendly it is while walking across the giant parking lot to Strack and Von Til where there’s no sidewalks or considerations for non-drivers. I think Logan Square residents would love it to be more friendly because they have so few options closer to home. I could. I don’t live that far away, and I’d certainly be able to take a bus or ride a bike there. I’m definitely not alone. How many thousands of people live within a mile or two of that intersection? The reason everyone drives is because it’s such a hostile place to be a pedestrian or a cyclist. Curb cuts and driveways every five feet, narrow sidewalks, disrespected or nonexistent bike lanes that act more as overflow for turn lanes than anything else. It’s no wonder everyone just drives. I live less than a mile from the Target on Logan. I never ever walk there because it’s just a crappy place to walk. I live less than a mile from this intersection, but I’d never walk to that Popeyes or Vienna Beef, because it’s just a scary place to walk. If you make a place a crappy place to walk, no one will, which makes people think that it’s just a fundamentally unwalkable place due to location, rather than conscious design choices made by the zoning regulations written decades ago, or an out of touch IDOT, who calculate road efficiency by not the number of *people* going through, but cars, acting as if all roads in the state are in the middle of Schaumburg and need a billion lanes and dedicated turn signals. It’s this weird chicken and egg problem. Make the area undesireble to walk in, more people will drive, which requires more parking, which makes the area even more undesirable to walk in, ad infinitum.